Another dyed-in-the-wool house classic here, from all the way back in the golden mists of 1987 on the tiny, cult Danica label. Don't forget, Mint Condition's mission is to bring you the classics too, a nice, new copy to play out in the club so you can keep your original nice and fresh! We care about these things. That's why we're happy to present this monumental slab of Chicago house history from one of the absolute gods of this culture - Mr. Frankie Knuckles - this time operating under his Night Writers alias. We're not sure too much needs to be said about this one, it's all here really, that classic Knuckles deep touch, the musicality, the vibe... Ricky Dillard's vocals encapsulating that feeling when the music takes over, pure abandon. The pairing of these two talents results in what would eventually become a bona-fide house CLASSIC. No arguments. If you're not familiar you're in for a treat, if you already know then you're nodding your head and agreeing with everything you've just read. Simple really - YOU NEED THIS ONE! 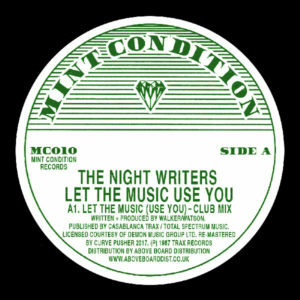 'Let The Music Use You' has been legitimately re-released with the full involvement of all license holders for 2017 and remastered by London's Curve Pusher from the original sources especially for Mint Condition. 100% legit, licensed and released. Dug, remastered, repackaged and brought to you by the caring folks at your new favourite reissue label - Mint Condition!